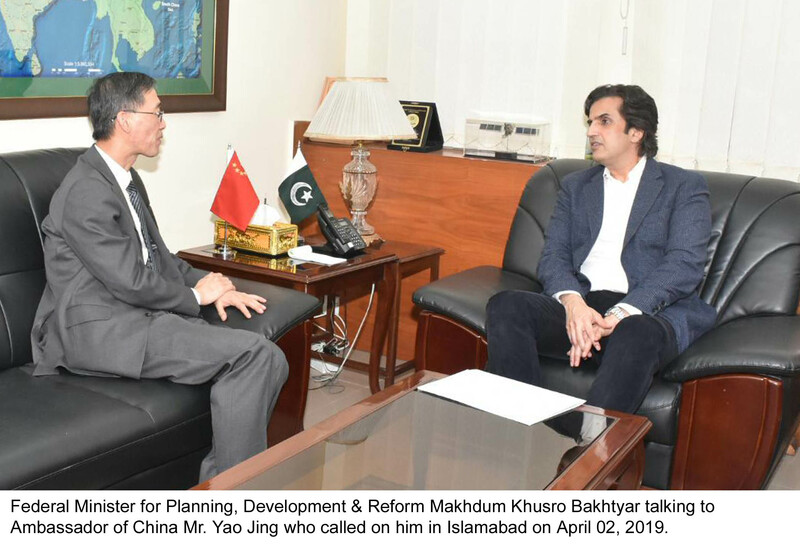 ISLAMABAD: April 2, 2019: Mr. Yao Jing, Chinese Ambassador in Islamabad called on Federal Minister for Planning, Development & Reform Makhdum Khusro Bakhtyar. The Ambassador appreciated Government of Pakistan’s efforts to fast track the China-Pakistan Economic Corridor projects particularly the groundbreaking of western route. Minister for Planning hailed China’s support for implementation of Gwadar Airport project. Makhdum Khusro said that the present Government attaches top priority to the development of Gwadar, highlighting that Prime Minister Imran Khan in his recent visit to Balochistan performed groundbreaking of the Rs. 65 billion Zhob-Kuchlak section of western route, Rs. 17 billion project of transmission line for Makran coast, Rs. 23 billion new Gwadar Airport project, hospital as well as vocational institute. The implementation of 300 MW energy project in Gwadar will be aligned with the development of Gwadar. 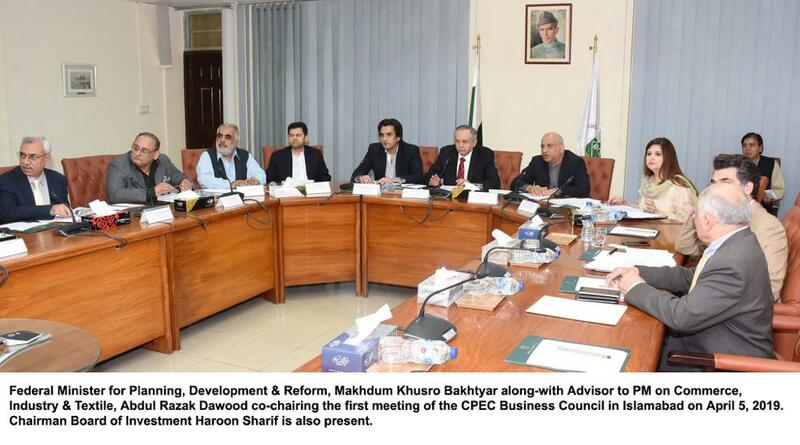 Minister said that CPEC has gained momentum and efforts would be made to continue the same pace in future. 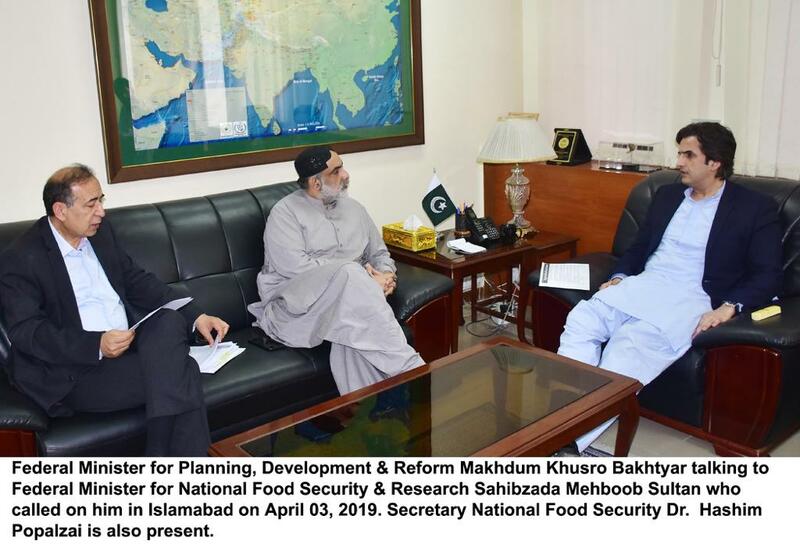 He stated that first special economic zone at Rashakai will be launched soon in order to enter into the implementation stage of Pak-China Industrial Cooperation. He further said that cooperation will be further strengthened by formal framework agreement focusing on joint ventures, and B2B cooperation. The Minister emphasized the need for robust cooperation between the business communities of the two countries. ‘We should move towards Pak-China Business Forum with representatives from leading companies of the two countries in various areas’, said the Minister. During the meeting, deliverables for the proposed visit of the Prime Minister to China to participate in the second Belt & Road Forum this month came under discussion regarding areas of industry cooperation, agriculture, socio-economic development and infrastructure.